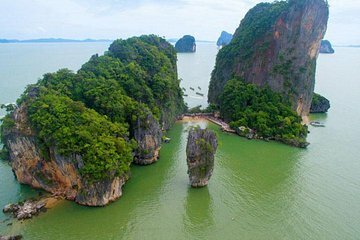 Voyage through the turquoise waters and limestone cliffs of Thailand’s Phang Nga Bay on a full-day kayak tour with plenty of stops to swim, snorkel, and relax on the best beaches. The route offers plenty of exercise plus views of the region’s top landmarks, like James Bond Island and the ancient caves of Hong Island. Refuel with lunch in a village built on stilts, and get a stress-free start with convenient hotel transfers from either Phuket or Khao Lak. Excursion au top ! La baie est magnifique. Le guide très très sympaJe vous recommande vivement cette journee !